Gallery — Explore our luxury Bangkok hotel photos. Location — The hotel is located on Phloenchit Road, offering convenient access to Express Way and other locations such as Sukhumvit Road. Contact — Contact our luxury hotel in Bangkok Thailand. 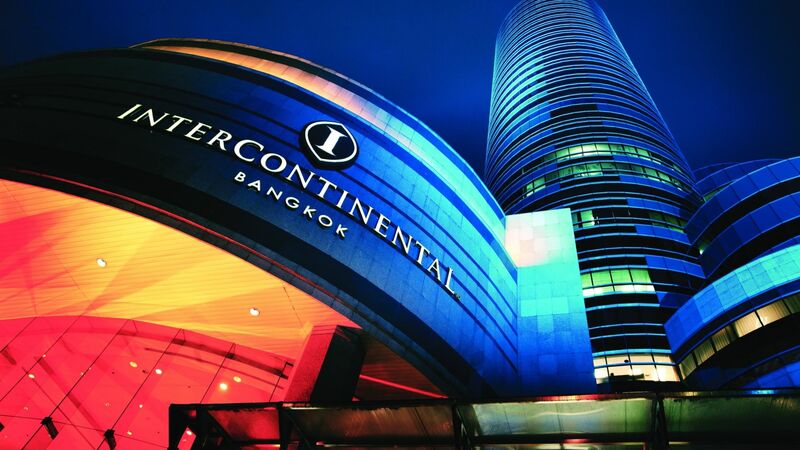 Home — Experience the InterContinental life at our luxury Bangkok hotel. Unlock new experiences in Thailand with exciting shopping and dining nearby. Special Offers — Discover a part of the world that is truly mythical with our exclusive Thailand hotel offers. Club InterContinental — For a new level of luxury, experience the bespoke services of our exclusive 37th-floor Club InterContinental at InterContinental Bangkok. Dining — Whether you're in the mood for white tablecloths or a lively local spot, Western cuisine or Thai food's renowned blend of spicy, sour sweet and salty flavors - Bangkok is one of the best dining destinations in the world. Spa InterContinental — Discover a unique urban spa destination where every element is customized to your time to spa at InterContinental Bangkok. Infinity Fitness — The spacious and exclusive Infinity Fitness offers the latest in electronic cardiovascular machines along with panoramic views of Bangkok. Oasis Pool — The freeform swimming pool and bar offers a refreshing oasis in the heart of Bangkok. Meetings & Events — Allow your guests to meet, greet, and unwind in style when you host a meeting or event at InterContinental Bangkok.